Today’s Daily Create assignment was to “look for interesting designs when you’re out and about.” Essentially, we needed to find some cool graphics somewhere, and take a photo of it. The problem with this challenge is the fact that, when you’ve got the “overworked, underpaid, sixteen-ton blues” heading into the weekend, it’s hard to keep track of anything, much less your intended goals. Thankfully, I found one image to tide me over until tomorrow. You’ve probably already heard of this one, mostly because the festival it was promoting celebrated its forty-fifth anniversary this year, due to the year it actually happened not counting in the long run. 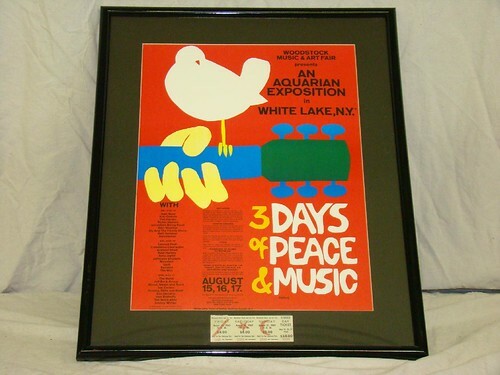 As for completing the necessary objectives, the poster in question is a minimalist piece, with the painted image, of someone playing an acoustic guitar by hand – not by teeth – while a dove, the previously-mentioned universal shorthand for peace, listens in, serving as the focal point of the poster, as a whole. As always, the process for getting this image on my computer was as quick as the makeshift showers the audience took during the actual event in question. Since the site that originally posted it is no longer running, the picture is now in the public domain, via Bing Images. With that in mind, I decided to download the image for myself, since it put as much focus on the poster as it possibly could. It was a straightforward affair, to say the least, without any real edits to make. As it happens, this image is now uploaded for viewing, on both my Flickr and Twitter accounts.